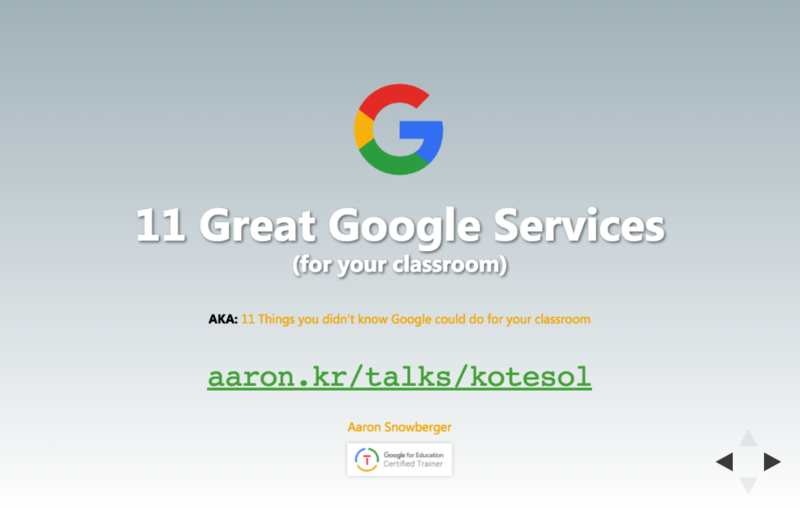 I want to briefly introduce you to 11 powerful Google Services that can have a big impact on your teaching. These are things that I personally use nearly everyday. I’ll start with the most commonly used and easiest-to-learn tools, and progressively take us through more difficult or less commonly used tools. The most ubiquitous Google Service is also the most powerful, and the most under-utilized Google service. Here are some tips to get the most of it. I’ve also linked to Google’s full Tips & Tricks page below. I know many people don’t think Google Translate is a really efficient tool, but there have been some really great updates to it recently that make it a much better tool. Drive acts like a hard drive in the cloud, but has some pretty unique features that you may not know about. Google Docs acts as an online Word document editor – but it has some unique features that are only available through a cloud service like this. One of the most powerful features in Google Slides is the ability to crop and edit images directly within the Slides window itself. I’ve previously created a complex PPT using the cropping images feature. I’ve included a link to this PPT below. I’ve also linked to some really great Slides Templates and an alternate to PPT (slides.com) – that this presentation is based on. Google Forms allows you to create self-grading assignments and quizzes. And if you need more flexibility and grading features, check out Flubaroo as a Google Sheets Add-on which can also analyze your student data and help you to see which questions were the most troublesome for a class. Google Drawings allows you to create complex vector shapes (like logos). They can even be embedded into Docs. I’ve previously presented on Google Classroom at the KOTESOL 2017 International Conference. One exciting new feature that I’ve discovered since then is that it’s now possible (since January 2017) to assign work to INDIVIDUAL students as well as the whole class. This allows me to personalize assignments for students. Google claims you can have UNLIMITED storage of photos and videos on their service – at a reduced quality (their uploader converts it automatically) – I haven’t run out of space yet. You can also create Shared albums that people with the link can “Add” themselves to and add their own photos. This is great for schools, families, and groups that want to easily encourage participants to upload and share their individual photos. Read more about this on the article Google Photos adds smarter sharing, suggestions and shared libraries. Sheets is a VERY powerful program once you start getting beneath the surface of things. It includes at least TWO useful features I’ll introduce here: Data Validation and Pivot Tables. I’ve previously presented at the JNJ KOTESOL 2012 Conference about this topic – to create a Gradebook that only accepts certain values. You can get Google Certified too! There are two levels of Google Educator, tests are $10 each (online, and require a web cam). This is a list of ALL the resources I gathered for this talk.